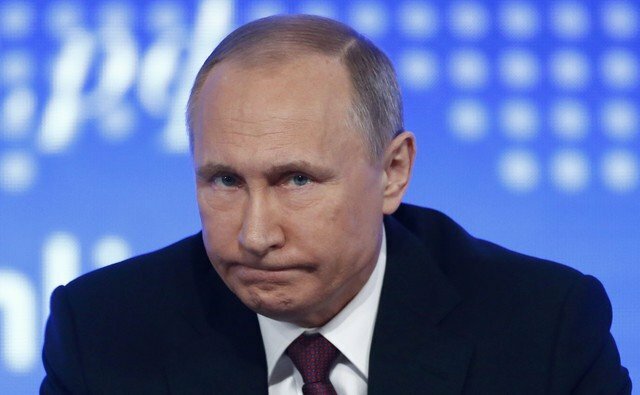 Vladimir Putin praised US President-elect Donald Trump on Friday, saying he had his finger on the pulse of US society, and launched a scathing attack on the Democrats, saying they had forgotten the meaning of their own name and were sore losers. Speaking at his annual news conference in Moscow, Russia’s president said that only Russia had believed that Trump would become the next president of the United States, but that did not mean the Democrats had the right to blame him for their defeat. “The current administration and the leadership of the Democratic Party are trying to blame all their failures on external factors,” Putin told reporters. “(We are talking about) a party which has clearly forgotten the original meaning of its own name,” Putin said, accusing the Democrats of “shamelessly” abusing their status as the ruling party to try to influence public opinion. “Outstanding figures in American history from the ranks of the Democratic Party would likely be turning in their graves. Roosevelt certainly would be,” he said. The White House and US intelligence officials have accused Russia of trying to interfere with the U.S. election by hacking Democratic Party accounts. Information from those hacks was leaked online, causing political problems for Democratic candidate Hillary Clinton. The question of who hacked the US Democratic party was not important anyway, said Putin, but what the hacks revealed – that public opinion in the United States was being manipulated – was. Putin, who spoke positively of Trump before his election win, said that Moscow had believed in his victory. Putin addressed Trump’s comments about the need to boost the U.S. nuclear arsenal, saying they were perfectly normal. Trump’s comments, made in a tweet on Thursday, alarmed non-proliferation experts who said that a boost to the US arsenal could fuel global tensions. But Putin said he was surprised by the fuss Trump’s tweet had caused and how it had been linked to his own statements about Russia’s plans to modernise its own nuclear arsenal. “I was a bit surprised by the statements from some representatives of the current U.S. administration who for some reason started to prove that the US military was the most powerful in the world,” said Putin.